Dear Hubs really went out of his way to purchase my favorite pink roses for Valentine's Day. This is actually the second bundle he purchased. The first set was well, pretty, but they were imposters. Ivory roses with a hint of a pink tip. He was determined to find another set of roses for me and he came home with these! Even better is when he said "you've just got to show these for Pink Saturday!" Just when you think your man isn't paying attention, he is. I hope you enjoyed them today. Check out the rest of the oodles of pink today at our favorite pink fest: Pink Saturday! I'm excited to be featured on Tammy's blog, Beatrice Banks. How sweet. I am completely honored. Thank you! Isn't he just the most thoughtful man ever! I'm honored to feature you today. Your blog is so pretty. Hope you have a great weekend and a Happy Pink Saturday! I hope you have a Happy Pink Saturday and a fabulous weekend....Your sweetie knows just what you love!!! Oh, what gorgeous pink roses, Jillian! Happy Pink Saturday to you and enjoy your weekend. I DID enjoy them today!!! I zeroed in on the middle of the link-pictures just now, lured in by those luscious pink roses. Just beautiful, and I LOVE that your DH is exactly like mine---he wants the exactly right thing he thinks I'll enjoy. How sweet he went out and got you a second arrangement. Lovely. Roses are just beautiful and what a sweetie your man is! I would say he is a keeper for sure! Such a beautiful share today, and how sweet of DH to get them for this special occasion. Sometimes they just don't open like we expect, and what better reason to get another dozen? I love it. I so enjoyed Tammy's write up about you. She did an exceptional job. Hope you have a beautiful weekend sweet friend. You husband is paying attention to the important things in his life. He made the right choice in these roses. Awwww he's a real keeper! Congrats on the wonderful interview over at Beatrice Banks! What a sweet hubby! 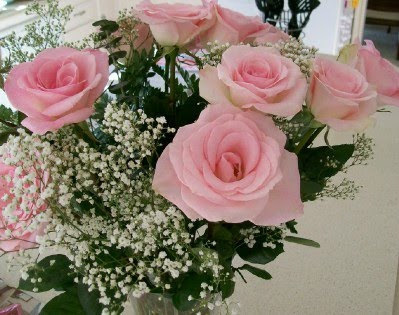 I love pink roses! Happy Pink Saturday! Beautiful roses & share, Jillian, sweet hubby. Very beautiful - happy Pink Saturday! Happy Pink Saturday, Jillian! Ohhhhh those are soooo beautiful! Hubs is a darling! Have a lovely "pink" weekend! 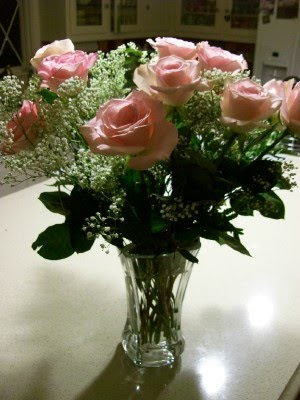 Roses are my favorite flower, and these pink beauties your husband gave you are gorgeous! How thoughtful he is. Happy Pink Saturday! beauteous! :) Love the pink! I came over from Tammy's blog to say how lovely your blog is... You have exquisite taste and have some wonderful treasures! Happy Pink Saturday....hope your week is sprinkled with little blessings...and covered with grace ! Hi Jillian-congratulations on being featured...you deserve it! Those really are just perfect pink roses! so pretty! Your roses are just gorgeous.... Happy Pink Saturday!!! What beautiful perfect pink roses! and what a sweet hubby to not be happy til he had the "right" ones! Have a beautiful PINK week, Jillian! Perfect is an understatement. Words can not do the beauty of those roses justice.